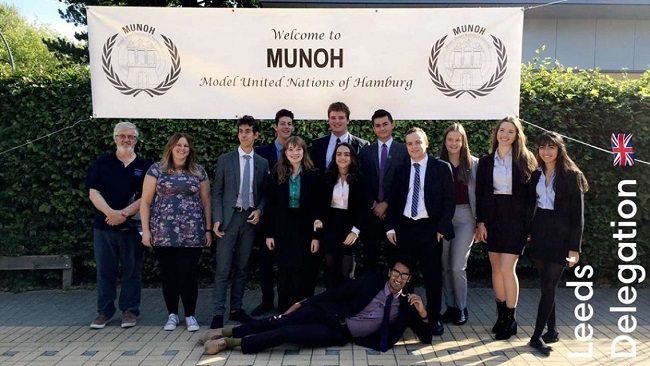 Last week a group of 11 sixth form students and two teachers from The Grammar School at Leeds (GSAL) attended the Model United Nations (MUN) conference in Hamburg. With over 250 delegates attending from countries all across Europe, including Italy, Germany and Denmark, this was an international conference allowing members of the GSAL MUN Society to converse with a diverse range of delegates and form lasting friendships. GSAL completely dominated during both committee debate and General Assembly resulting in a record breaking result for the team with seven awards in total out of the nine committees present. Emily Sambidge, representing Russia on the Security Council, won most distinguished delegate, an impressive achievement, as this is the most prestigious council which attracts the top students from each school. A special mention also goes to Amir Khan, Pietra Sorze and Sam Kunin who were all newcomers and yet were still able to win most outstanding delegate – the highest ranking award of the conference. Despite there being no best delegation committee this year, it was clear that the GSAL delegations of Mali and Russia dominated the debate producing excellent resolutions, amendments and speeches. History and politics teacher Cathryn Haigh accompanied the delegation along with head of politics Andrew Stodolny. Miss Haigh said: “We were impressed with the way that the GSAL delegates represented their countries to drive forward the debate in every committee and commission. From taking part in the conga at the MUN party to making new friends at the barbeque and enjoying German cuisine at a brewery, an excellent time was had by all. As put by Ralph Bunce “The United Nations is our one great hope for a peaceful and free world.” This hope was very much felt during the 2018 MUNOH conference.